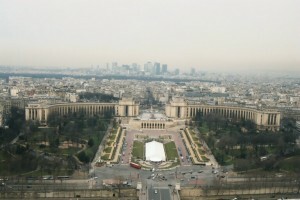 A number of museums I wanted to see are closed on Tuesdays so I decided to visit the Rodin Museum and Napoleon's tomb. The Rodin Museum and gardens was great. Unfortunately my favorite Rodin, "The Thinker", was on loan to Berlin so I was forced to look at other works of art such as "The Kiss". Très passionné. I spent a lot of time studying Rodin's various works of Balzac. Having such an imposing build and distinct facial features I can easily see how Rodin become obsessed with him. As I was making my way through the museum I spotted a marble bust that looked familiar. It turned out to be of Mrs. Potter Palmer of the Palmer House fame. I was pleasantly surprised to find such a beautiful work of art of a prominent Chicagoan on display in Paris. Having learned of Mrs. Palmer from the Chicago Architectural Tours on WTTW, I'm sure Mrs. Palmer would have been very proud to know her face is on display in Paris. 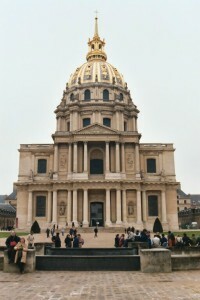 After the Rodin Museum I walked across the street to Invalides, home of the military museum and Napoleon's Tomb. Invalides was once a hotel and is very large containing several military related museums as well as Napoleon's Tomb and The Soldiers' Church. Somehow I ended up going in the wrong way and ended up visiting parts of the museum I hadn't planned on seeing and missing some that I wanted to see. I started off with the Museum of the Order of the Liberation. It was a very interesting museum, but not what I had intended to see. They had a lot of artifacts from the French Resistance as well as a number of Nazi artifacts and a decent exhibit on the deportation including clothes worn by Jews and captured French Resistance. Following the Museum of the Order of the Liberation I made my way to an exhibit on World War II. They had a lot of artifacts I had never seen before or had only seen on TV or in books. It really gave some perspective on just how terrible World War II was. By time I finished with World War II I was really ready for lunch. Since I didn't know what was around I ended up eating in the museum cafeteria. Most of the food they had contained ham, so I ended up having a pizza (or what they call a pizza.) Pizza in France is not the same as what they have in the US. The pizza was basically a strip of cardboard (dough) with a squirt of ketchup (or what they call pizza sauce) and several wedges of brie flipped sideways so the middle will melt out. I only had a few bites before I finally got too grossed out and gave up. That's what I get for trying to eat museum food. I should have had the salad instead. 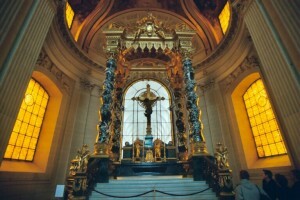 After lunch I went to Napoleon's Tomb inside L'Eglise du Dôme (Dome church). WOW! Everything is on a grand scale and covered with gold. The Emperor's tomb is on a lower level and is made of red porphyry on a green granite base. 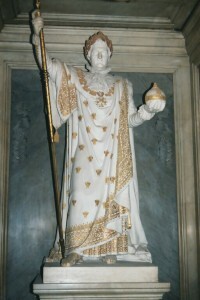 From the the size of it you would think Napoleon was ten feet tall. Off to the side of the tomb was a small chamber with a large statue of the emperor raised up in a way to make him appear larger than life. There were other museums in Invalides that I wanted to see, especially the collection of weapons and armour. Somehow I couldn't find them and since the map showed a different entrance I thought there was a separate admission for them (turns out there wasn't.) I decided to walk to the Marine Museum at Palais de Chaillot but failed to notice my note that it was closed on Tuesdays. Even though my feet were really hurting I decided to walk blisters and all to the Musée Marmottan Monet. What a waste. They should have called this the museum of paintings Monet couldn't sell. There were many variations of the same theme repeated over and over again. Many of the paintings were rather dark and dreary. There were a number of paintings that looked like they were in a fog. The one section I enjoyed was the Le Havre caricatures, which was only a small part of the museum. After a very disappointing afternoon and feeling tired and dehydrated (no drinking fountain in a museum?) I decided to call it a day and go back to the hotel. Luckily while I was resting in the Monet museum I was able to figure out how to find the Metro stops on the map so I didn't have to walk back.